Scroll down to examine today's classwork and primary sources. Today you will play detective (if you are working with a partner, each of you must turn in the classwork below. Use the mini-scroll bar to navigate within the classwork file. 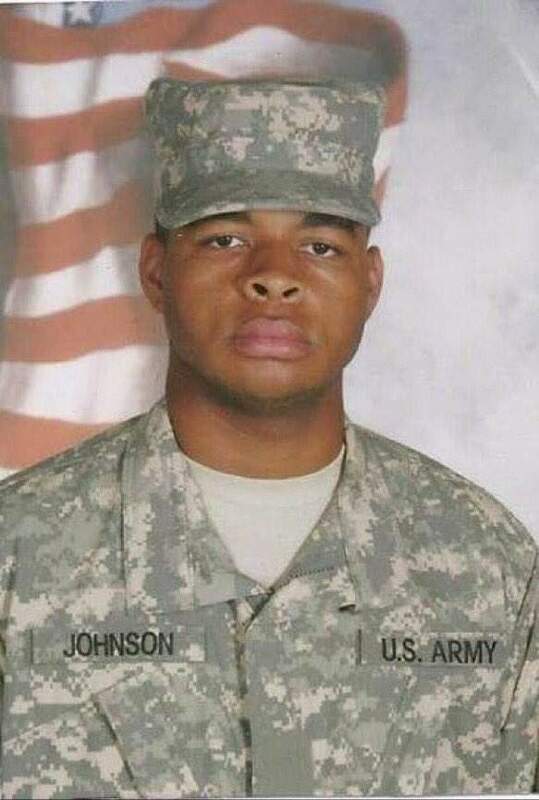 A black military veteran uses a high-powered rifle to target white police officers. Like all well-trained shooters, he knows that aiming for center mass is an efficient takedown, but a headshot is a guaranteed kill. His one-man war against the police department is broadcast to millions of American homes. Black citizens cheer him on, convincing the “silent majority” that a race war in a major Southern city is possible. Born and raised in Emporia, Kansas, Essex lived a fairly ordinary life. Emporia was only two percent black during his childhood. 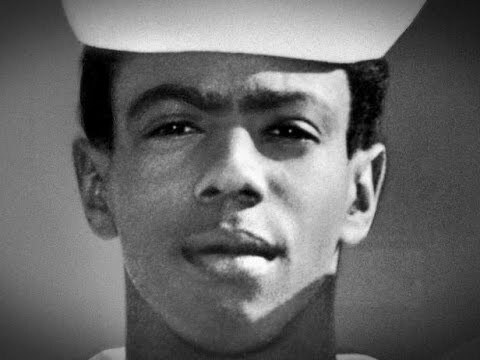 Like most mass murderers, he was described as a “loner.” In 1969, after graduating from high school and very brief stint in college, Essex joined the US Navy. The war in Vietnam was still very hot, but Essex, who served as a dental technician, never went overseas. Not long after joining the fleet, Essex began complaining that white peers and white petty officers made his life extremely difficult. At the Naval Air Station in Imperial Beach, California, Essex provoked a fight with a white superior. Essex wrote letters back home complaining about white racism. He grew his hair long and ran afoul of military grooming standards. He started reading about the Black Panthers and other militant black organizations. Whether real or imagined, Essex’s encounter with racism in the Navy inculcated in him a hatred for all white people. After just two years, Uncle Sam kicked Essex out of the service with a general discharge. Officially, Essex was considered unsuited for the Navy due to “character and behavior disorders.” Once again a civilian, Essex drifted around America. He briefly joined the Black Panthers and lived for a while in San Francisco and New York, before finally settling in New Orleans. New Orleans had mostly been spared the anarchic violence of the Civil Rights Era. However, the city was hardly a multi-racial paradise. Black Panthers and anti-war demonstrators numbered in the hundreds, if not thousands. Africa greets you. On December 31, 1972, aprx. 11 p.m., the downtown New Orleans Police Department will be attacked. Reason — many, but the death of two innocent brothers will be avenged. And many others. P.S. Tell pig Giarrusso the felony action squad ain’t $#%*. The sign off, “Mata,” was what Essex had begun calling himself—meaning “hunter’s bow” in Swahili.” “Giarrusso,” referred to Clarence B. Giarrusso, the police chief at the time. True to his word, Essex drove to Perdido Street and waited for NOPD officers to leave the nearby station on December 31, 1972. He shot black police cadet Alfred Harrell to death and wounded Lieutenant Horace Perez. Essex fled the scene and broke into a warehouse in Gert Town, a black neighborhood where anti-cop prejudices ran high. Responding officers had no idea that the break-in was related to the murder of Harrell and Perez. K-9 officer Ed Hosli, Sr. was investigating the warehouse at South Gayoso and Euphrosine streets when Essex shot him in the back. Hosli died from his wounds two months later. Six days after New Year’s Eve, Essex shot and killed a white grocer who had told the police about him. Essex then stole a car and promised its owner that he did not want to kill black people like him, “just honkies.” On January 7th, Essex invaded the Howard Johnson hotel at 330 Loyola Avenue. Essex raced up an emergency staircase to the 18th floor. Three black hotel employees saw a man with a rifle running down the hallway. Seeing their fear, Essex tried to reassure them. “Don’t worry,” he said. “I’m not going to hurt you black people. I want the whites!” The maids ran into a hotel room and locked the door behind them. A white man named Robert Steagall, on a honeymoon with his wife Betty, opened a room door. He saw a man holding a rifle. Robert screamed and rushed at him. Essex shot Robert Steagall in the chest. Betty Steagall screamed, then knelt beside her wounded husband and cradled his head in her arms. Jimmy shot Betty in back of her head. Both Steagalls soon died. Essex walked into the room in which the Steagalls had been staying. He poured lighter fluid on telephone books and set them afire. As he left, he dropped a Pan-African flag beside the bodies of the Steagalls. On the 11th floor, Essex shot his way into several rooms and set more fires. On the 11th floor, he shot and killed Frank Schneider, the hotel's assistant manager, and shot Walter Collins, the hotel's general manager. Collins died in the hospital three weeks later as a result of his gunshot wounds. Seeing the story on TV, Lt. General Chuck Pitman of the United States Marine Corps offered the use of a CH-46 military helicopter to assist the police officers. The helicopter was loaded with armed men and dispatched to the hotel. By this time, Essex had retreated up to the roof of the building where he and the helicopter exchanged many rounds over many hours. As nightfall came, Essex managed to hole himself up in a concrete cubicle that would protect him in the southeast side of the roof. “Come on out, you honky mother-fuckers!” Essex screamed. “What’s the matter? You afraid, pigs?” Essex shot. Again there was a lull in the shooting. Giarrusso asked a black officer to appeal to the sniper. United State Marine Corps Lieutenant General Chuck Pitman watched the carnage on TV. He offered the New Orleans Police Department the use of a CH-46 military helicopter. NOPD officials eagerly accepted. As night fell, Essex took cover in a concrete cubicle. In the morning, he left the protection of the cubicle and walked into the open air of the roof. He fired at the helicopters. Police sharpshooters on the roofs of nearby buildings and shooters from the helicopter unleashed a barrage on Essex. He fell dead. The autopsy later showed that his slender body had received more than 200 gunshots. His morning action appeared deliberately and consciously suicidal. P.S. Tell pig Giarrusso the felony action squad ain't sh%&. Essex' life was ended about 9:30pm Sunday night, when he emerged from a concrete cubicle on the roof and was shot to death via hundreds of rounds from police on the surrounding skyscrapers and from a sniper team circling the roof aboard a Marine Corps Reserve CH-46 helicopter. But the death of the lone gunman did not end the siege. It would continue another 15 hours, fed along by numerous reports of more shooters and resulting in thousands of more rounds fired and dozens more helicopter sorties. And the number of wounded would continue to rise. In many of the manipulated mass shooting incidents, reports of more gunmen are supplied by civilian witnesses. The New Orleans shooting is different, in that most of the references to more shooters instead came from the police themselves. Unknown cop: "There must be two of the bastards. That guy was in green, I thought the first one was dressed in black." "Giarusso.. was already getting conflicting reports on how many gunmen were loose in the building, with some of his men insisting that they had seen two blacks--one tall, the other short--shooting simultaneously from different balconies." (NOPD) Captain Randall: "We're assuming there's two up there. At least we can hear different-caliber weapons." "Giarusso also received a report from patrolman John Fields, a sharpshooter on the roof of City Hall ... Fields said he had seen two blacks at the entrance to the cubicle(on the roof)... Other reporters also reported there were two men on the rooftop..."
LtCol. Chuck Pitman, USMC, pilot of the helicopter circling the roof: "We always thought there were at least three snipers, and that they had automatic weapons." "Detective Dan Dunn and Lieutenant Richard Hunter... were exchanging theories of their own. It seemed likely that the attack had been set up months in advance, probably by four or five persons, possibly by militants from out-of-state." "When the helicopter pulled off, the Rault Center(a neighboring high rise) reported that "two, possibly three persons" were still shooting on the roof." NOPD Lieutenant Schnapp: "From our position we can sure hear two voices..."
" "We can hear people talking up on the roof," Lieutenant Hunter said, calling from the Gravier(Street) stairwell." "You think this person is talking to himself? That he may be irrational?" "Negative. It appears to be two people. ...earlier we did hear two distinct voices shouting. One right by us and another farther away." Lieutenant Schnapp radioed from the Perdido(Street) stairwell. "..when the firing started, it sounded like there were two calibers, one heavy, the other light." "Same with us," Hunter said. "We heard two different calibers." "
"As the helicopter departed, Captain Curtis Gaudet reported from the eighteenth floor that someone was "still shouting up there." "Chief, I definitely see his muzzle fire coming from that cubicle on the river side," reported Car 406." "It really sounds like there's two of them left up on that roof," said Captain Gaudet. "We can hear them talking to each other." "..we thought we still had a whole herd of people up there. ... there was still gunfire going on and bullet whizzing overhead while they refeuled the helicopter(at the nearby Naval Air Station)... people were still shooting at one another." Essex had murdered nine people, five of them police officers. All save Cadet Harrell were either white or Hispanic. He seriously wounded another 10 people. Police fire had inadvertently wounded nine people. One person in the vicinity of the shootings had suffered a non-fatal heart attack as a result of the trauma. The city of New Orleans had sustained millions of dollars in financial loss. The Howard Johnson’s Hotel had sustained damage that would require millions of dollars to repair. In the aftermath of the shootings, then Governor of Louisiana Edwin Edwards said he would consider reinstating the death penalty for “heinous crimes.” This was an odd reaction. It seems likely Essex knew he would be killed. The threat of execution is meaningless to someone who plans to die during his or her crimes. Unfortunately, some black leaders issued statements appearing to condone the horror. 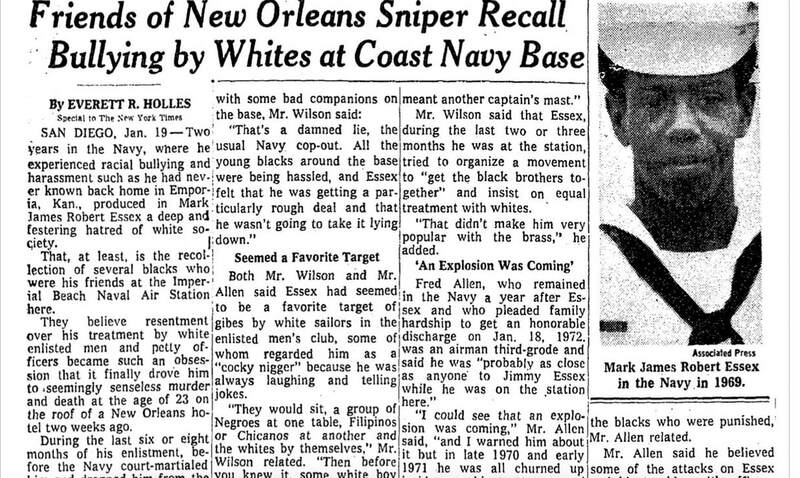 Police Fail to find "Second Sniper"
After looking for and failing to find a suspected second sniper, New Orleans Police officers found Essex’s apartment on Dryades Street. Inside, the walls were covered in anti-white graffiti. Most of the words were nonsensical phrases borrowed from Swahili and other African languages. 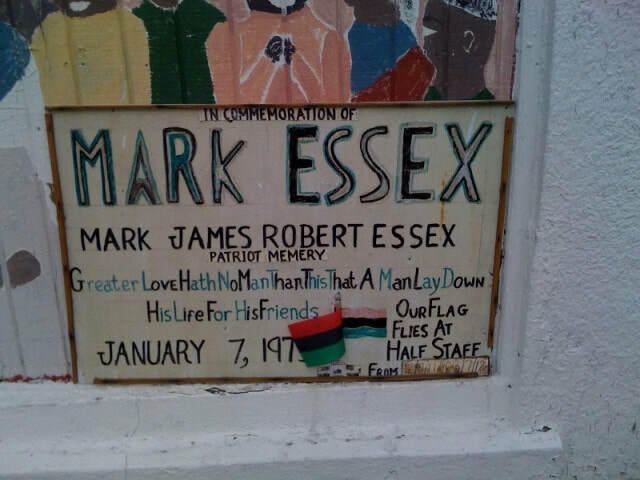 Essex, it seems, thought of himself as a resurrected Mao Mao warrior fighting white settlers. These are the direct ancestors of the Black Lives Matter movement. In allying themselves with the Black Panthers and other militant black organizations, the American Left is turning more people into the likes of Mark Essex. 1973 was a terrible year for white America. Besides the crimes of Mark Essex, San Francisco’s Zebra killers were killing white police officers and butchering white civilians while white and black Leftists cheered them on. The Zebras killed fourteen people, but you have probably never heard of them. Essex held a city in complete terror for weeks, and you’ve probably never heard of him either. Forgetting such history makes whites vulnerable to the next attack. 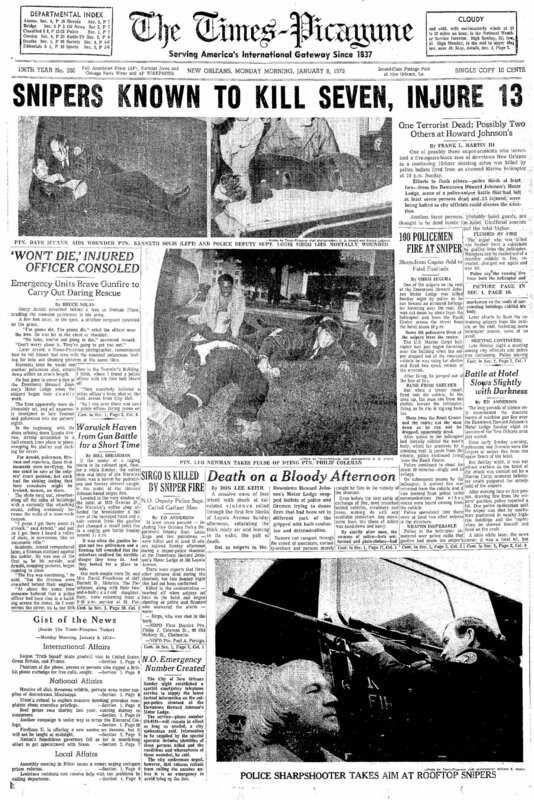 "Shortly before two o'clock in the morning, Giarusso was deluged with reports that a sniper had crawled out on a 'ledge' on the roof of the hotel and was firing across Loyola Avenue. Five men on top of the Bank of New Orleans said they could see someone in a white t-shirt, "lying on the corner of the roof not far from the Perdido stairwell. There were multiple sightings, and police in both stairwells reported hearing the clatter of an automatic carbine." "It was now almost two-thirty(Monday morning, the 8th of January). ...spotters continued to report that gunfire was coming from the Gravier Street cubicle(located on the roof)..."
2:45am: "..reports of gunfire broke out anew. Men in the stairwells heard shouted obscenities, and from the tops of buildings, spotters with binoculars saw shadowed movement." 5am: Reporter on the scene: "The helicopter is right over the building now. It's very low, right in front of those cubicles. You can see the light playing on the walls. Wait! They're firing! Apparently they saw him. They're really pouring it in." "New Orleans fire chief Louis San Salvador was quoted as saying that it was virtually impossible for one man to have set the fires himself. "There is at least one more and he walked away from it," San Salvador told a reporter." "..there is some evidence someone may have arranged for a room for the dead sniper..."